As you continue to be more mindful of your thoughts, surroundings and energy, a new-found clarity begins to evolve. Anyone familiar to the practice of meditation probably knows what I am talking about. As you continue to be mindful of the present and mindful of what is going on right now inside your head, you begin to see new intricacies as it relates to the mind. For me, I have been successful in separating the True Nature within which is my intrinsic, even immortal potential for reaching enlightenment (my life source) and the ego which represents my more crude social existence (my false-self as compared to True Nature). Still, I think there is a discernible third entity in there somewhere. Sigmund Freud talks about three parts of the mind apparatus in his famous structural model of the psyche. He talks about the Id being the primal, almost instinctual force that is unresponsive to the demands of reality. The ego reacts to the reality principal working to find a mutual compromise with the Id that touches more on realistic needs and not necessary primal needs. The Super Ego aims for perfection incorporating both the Id and Ego and appears to be the voice or mediator between the minds facilities. This is more than likely the root of suffering as the Super Ego can never be fully appeased. It seems all three modes of apparatus overlap each other to an extent. Further, it is clear that Freud’s model leaves out an important Buddhist principle: True Nature: Enlightenment and non-duality. Sigmund Freud was not one to mix religion with science but I would offer that Buddhism is more of a philosophy than a religion. So where does this leave me? 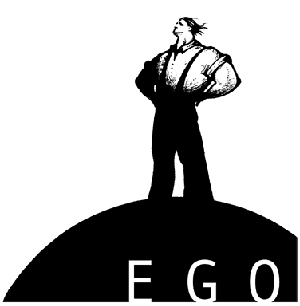 I know there is my ego – through social immersion the ego is a bi-product of society. When you limit the egos power, our true self emerges – the Essence of True Nature. Still, there is an intermediary voice that sometimes pushes and tugs between the two entities. Sometimes this voice is your friend and other times you question if it is looking out for your best interests. My best analysis for this illusive third entity is that it is an overlapping process of mindfulness that combines the ego and True Nature – it is sort of the front line (the demilitarized zone) in the battle against false self and true self. It appears the focus is to push beyond the ego which is rooted to unnecessary dogma and social trappings and even push past that imaginary line that separates the mediocre with the sublime and try to live in the present as long as possible – away from fear and fantasy – thoughts of the past and future. Everyone interprets the mind differently. My interpretation is definitely different from Freud’s as I am adding the facet of True Nature to the equation. You have to ask yourself what is that state of non-duality that exists before our birth and after our death? Energy is our source – we are born from energy and we will die and return to energy. The facet of energy or True Nature needs to be added to the apparatus of the psyche. Without it, humans would be a real hot mess laden with bad habits and suffering. Oh wait, we are already…. And finally, one has to ask the question: Was Sigmund Freud a happy man or a victim of his Super Ego? The ego’s bad rap | Chores. Love. Service. « Is Quantum Physics God?